A wife who loses a husband is called a widow. A husband who loses a wife is called a widower. A child who loses his parents is called an orphan. 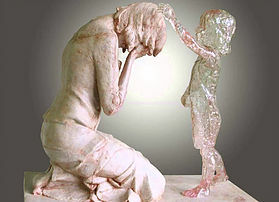 There is no word for a parent who loses a child. That’s how awful the loss is. This is something I have struggled with ever since we had our first miscarriage. That moment we had our future taken away from us; the future that had our child in it. Since Ben died this has become even more relevant. When someone asks “How many children do you have” I can now respond, “I am a Vilomah”. Along with the badge, I’m hoping to raise the profile of the word Vilomah. Vilomah means ‘against the natural order”. The grey-haired should never bury those with dark hair. I know not everyone will be comfortable with the badge but I hope that this may offer something as well. A way of helping people understand the ‘new’ world we find ourselves in. A ‘label’, a ‘name’, for the complete unthinkable.